This is an article-in-progress, So much in progress that I really do not have much to share with you in terms of explanatory text. The situation is that I have come to a time where there is a lull in enthusiasm for writing but I have lots of enthusiasm for doing stuff. The result of all this is that I have followed up on the Demonstration Quality cheap scanner based improvised digital camera (wow! that's a mouthful!) and gutted a KYE EasyScan Color Deluxe hand operated scanner (cost me $45) and essentially did the same thing with it as I did with the Kodak one. 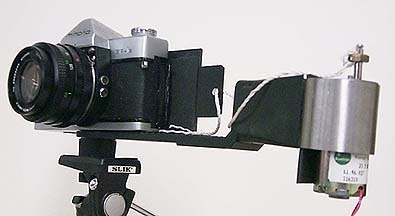 Read all about it at: Kodak Snapshot Scanner Based Improvised Digital Camera. So, right now what I would like to do is to share a couple of photographs with you. The photographs are panoramic, encompassing 360 degrees but where with the Kodak gadget I turned the camera by hand to cover 360 degrees, this time I placed the camera on a motorized tripod head (also made from cannibalized parts) and so the scanning is much more regular. The first photograph was taken in my lab and is almost 360 degrees and the next two were taken in front of the School of Photographic Arts and Sciences where I did not only a "visible" B&W record but also made a matching Infrared record of the surrounding landscape. I am happy to say that I have now used the array to make a color photograph and it is shown below. There is sort of an interesting story to go along with this photograph. The story is that the lens that I had on the camera was much too long for the proportions of the image that the scanner is programmed to deliver, namely about 4 (inches) by 14 (inches). I decided to scan anyway, placing the full 360 degree view within the available space. The problem was the length of the image and the result was that everything seemed very compressed. However, later on I used the Photoshop program to compress the height of the image without changing its length. (Or maybe what I did was change the aspect ratio of the image without changing the file size!) 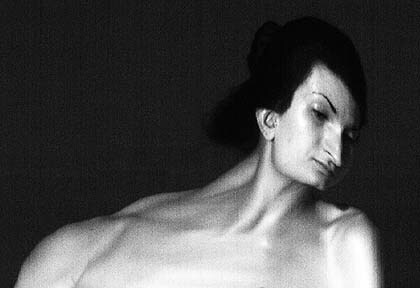 Anyway, the ultimate effect of doing this was that the proportions of the subject in the photograph improved considerably! So now what do you think of THAT! 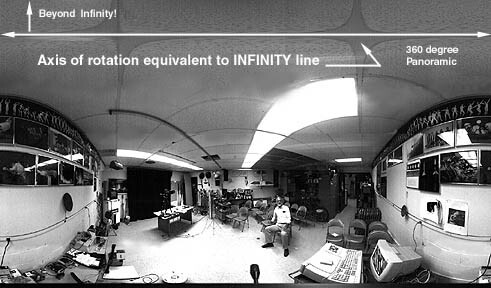 This first photograph below shows my lab and it is a composite of 5 360 horizontal scans assembled together by hand. You are starting to see beyond infinity! In the next case the camera's lens was fitted with one of those "through the door" surveillance peep gadgets. This enabled the camera to have a very wide angle of view along the CCD array. The camera was then pointed almost straight up and rotated. In this photograph (despite its minor flaws related to leveling and consistent scanning rate, etc.) the relationship between what is in front of the camera ("reality") and what is "beyond infinity" is much more clearly evident. I hope anyway! * Breaking News! 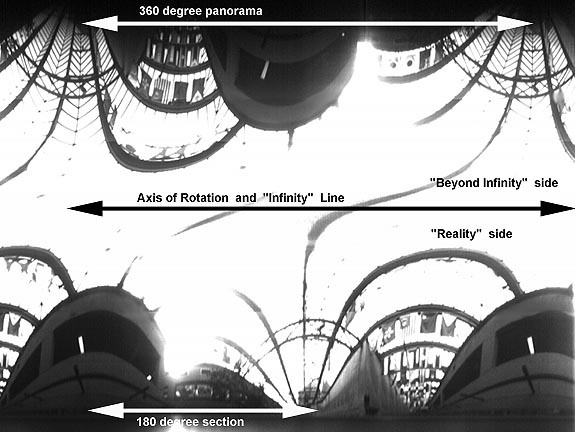 ... based on this latest bit of research (and assuming that the top of any observer's position is that which is closest to infinity) actually things beyond infinity only seem to be upside down if looked at from the "reality" point of view. From this point of view subjects also do not look like they are reversed left to to right with the reversal actually happening when the point of view is switched to being beyond infinity. The "180 degrees out of phase" with reality condition is, however, unviolatable and unmistakable. Experiments are continuing. Major problems to overcome for this "el cheapo" scanning camera is devising a more consistent, steady, scanning pace. 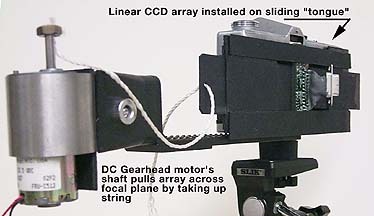 The device is now driven by a rubber band powered by the shaft of a low speed gearhead motor. It may be possible to improve on this with a thin "O" ring or maybe driving the hand scanner's data acquisition wheel with something else altogether. There is a certain charm in moving it with a rubber band though! Also, the "peephole peeper" lens will be replaced soon by a better quality fisheye adapter and then the optics and image sharpness will, hopefully, be better. As of May 20, 2000 I have not yet gotten to this project! But I will soon! And this is a "self-portrait" that is not really peripheral. It was made by the camera just accumulating image data while I moved back and forth across the CCD array several times. 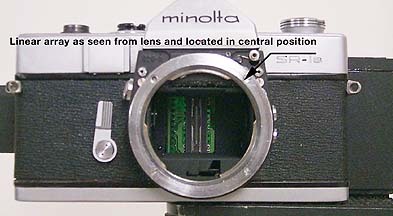 Finally, I "improved" on the attachment of the linear array to the 35mm camera's body by flanking the array with two "tongues", one on either side, and directing or controlling this assembly by placing the tongues into a "C" channel in such a manner that the array could be moved across the film plane of the camera. The motion of the array is controlled by winding up a length of sting onto the shaft of a slow turning rate but high torque DC gearhead motor whose speed is adjusted by changing the voltage to the motor. At the beginning I simply tied the string to one end of one of the "tongues" as shown in the pictures above but being absent minded I forgot to turn off the motor once the array had been pulled across the image plane and this broke a piece of the cardboard. After the second time this happened I cyhanged the method of attachment to the tongue by resorting to a small "C" clamp that simply slid off the tongue once resistance was great enough at the end of the array's travel. You can contact the author at RIT at andpph@rit.edu.